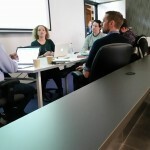 I have been mentoring students undertaking their Executive MBA at RMIT recently. The unit is Consultancy where they undertake a real life consulting project working with a client and with a mentor who provides support and learning from their industry experience as a consultant. It is a different way of learning but has some direct translation to real life practice and transfers the paradigm from academic to practical and experiential. The learnings are around developing a consultancy project, understanding the client/consultant relationship, questions of ethics, collaboration and understanding the issue and questions of expert. Saturday was their presentation of recommendations to the client which is followed up by a report for the client. The process is of three way benefit, students, client and mentor. This entry was posted in student learning and tagged coaching, conversations, development, knowledge. Bookmark the permalink.